In order to prepare the best base for Tylecodon cultivation from the seed, you’ll need these ingredients: substrate with good drainage (the best option would be garden soil and pebbles) and coarse sand. You don’t need to mix the ingredients, as we need to use them separately. Sterilize all the ingredients you use as a base. You can do that by putting it in a microwave oven for 3 minutes or in an oven for 45 minutes at the temperature of at least 360°F (180°C). After you sterilize the substrate, let it cool down. Containers for sowing: you can pick the smallest you have because this plant glows slowly and doesn’t develop a deep root. It’s obligatory to puncture holes at the bottom of the container, so that the excess of water can leave the container. First put the pebbles in the container, and then use the substrate for the next layer. The substrate should be mixed with pebbles (use can use perlite instead of pebbles, pieces of brick or anything that can ensure good drainage). Top it all with a layer of coarse sand. Put the seed into the container and gently tap it with a flat object. It’s not necessary to additionally cover the seeds. Put the container with seeds into another dish with water that you had boiled beforehand and let to cool down (you can use rainwater instead of boiled water or tap water that’s a couple of days old). Wait for a few minutes for the substrate to dampen and then take the container with seeds out of the water and leave for the excess of water to drain completely. Keep the moisture inside the container by covering it with a transparent piece of glass, foil, bag or something similar. You don’t need to provide any temperature for the germination process to occur, because this is a plant that’s active during winter so it’s for the best if the planting process occurs during winter. Leave the container at room temperature, but as far as possible from the heat source. The seeds will begin to germinate in 10 days to 1 month. When most of them germinate, remove the glass that you used to keep the plant moist. In the beginning, this plant will have a very slow growth pace. It will need around 2 years to get to about an inch (2cm) in height. It speeds up its growth process afterwards. As soon as the majority of seedlings germinate, it’s important that you add as many pebbles as possible so that the plant isn’t brought down and doesn’t stick to the ground (you need to do this with the older plants too, because they could crash under their own weight), and by doing that, you’ll be providing conditions similar to the ones the plant experiences when it’s growing in its natural surroundings. 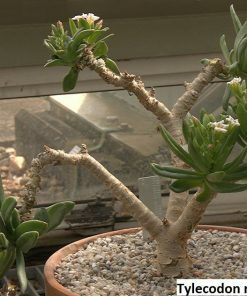 The first repotting can be done only after 1-2 years. Don’t opt for oversized containers because it will slow down the plants progress and growth. 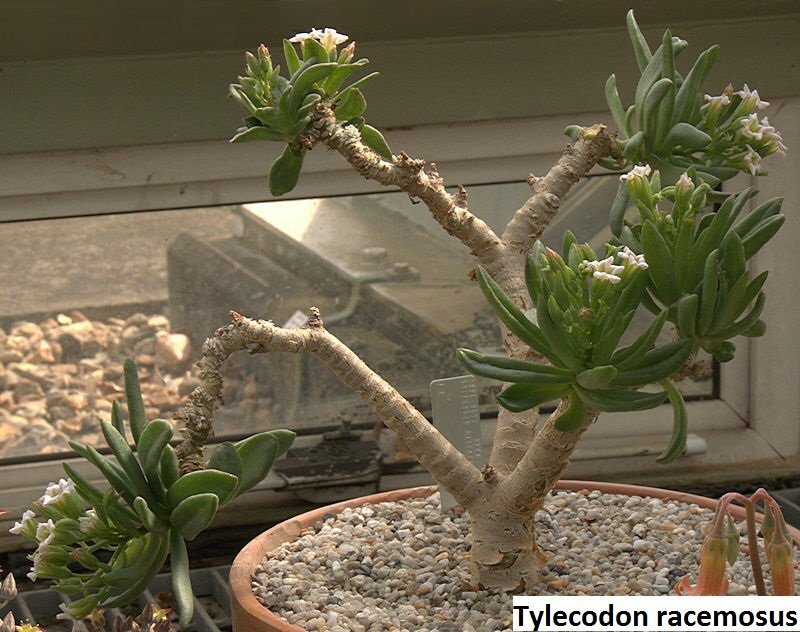 Place: Tylecodon can survive direct sunlight exposure without any problems, but it will grow beautifully when in shadow. This plant is considered to be extremely tolerant when it comes to high temperatures too. 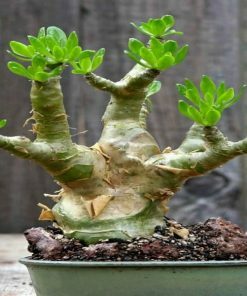 This is the type of a succulent that’s active during winter so you need to provide watering for them once a week (with an addition of an occasional spraying, i.e. rain simulation). Decrease watering to minimum during summer. This plant is ideal for rockery. Watering: This plant belongs to a type of succulents that can withstand the heat in a good way. You should water it only when the soil around the plant is dry for a couple of days. It demands a good substrate drainage because the lack of it represents the most common problem and cause of rotting root. Wintering: The lowest temperature Tylecodon can withstand is 25°F (-4°C), but provided that it won’t be a long time period. It’s for the best if it spends its winter the same way the cactus does, in a coldish, brim room that’s not heated. It’s often mentioned that this winter plant will look its best during a colder period, while it will shrink during the summer or drop leaves completely. Repotting: You don’t need to repot this plant often. You can do it when you see that the container it’s in becomes too small or shallow. It’s for the best to move it with the soil located around the root. Substrate: You can use the substrate for cacti with an addition of pebbles. Or you can make a combination of (mostly) sand, garden soil and pebbles by yourself. This plant grows in rocky areas, so be sure to provide it with pebbles positioned around it. Topdressing: Use liquid fertilizer for cacti and other succulents during the winter months.